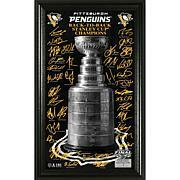 The 2017 Stanley Cup Champions Celebration Signature Court features the facsimile (replica) signatures of the players on the team roster displayed over an image of the team celebrating after clinching the title! Each is individually numbered and delivered in a 12” x 20” wood frame ready to be shown off. Limited edition of 5,000 and officially licensed by the NHL and NHLPA. Proudly made in the USA by The Highland Mint!